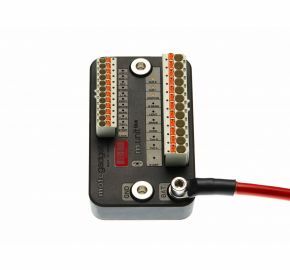 The m.unit basic is the new digital control unit from Motogadget based on the reputable m.unit V.2. Undergoing significant development and improvements, it is now equipped with 12 inputs, 10 outputs, and replaceable high-quality cable clamps. The m.unit basic is made of a newly designed high-performance thermosetting plastic and is resistant to moisture, heat, cold, and vibrations. Microprocessor-operated and supervised circuits guarantee the highest reliability. In case of failure, such as a short circuit, the connection circuit affected is instantly shut down. All switching activities are performed by state-of-the-art semiconductor switches in a fast, wear-free and almost loss free way. 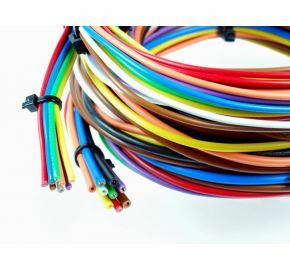 No other devices, relays, boxes or units as part of the wiring harness are therefore necessary. A complete wiring of the vehicle can be performed with minimal time, materials and effort. Compared to conventional solutions, only a fraction of the space and cables are needed. The m.unit basic and m.unit blue are the replacement for the discontinued m.unit V2. Diagnostic feature for layout of input, output, circuit switching status plus diagnosis of electrical circuit, short-circuits, etc.